Japanese contemporary print artists use traditional printing methods or new processes, or often a combination. Below are brief descriptions of the main printmaking techniques. The artist creates raised surfaces on a plate that will be used to transfer the images onto the paper. The raised surfaces are hand-inked, and placed on paper where the artist applies pressure to print the image. Raised surfaces can be created through carving or cutting a block, or by gluing different materials onto a plate. Woodcut or woodblock, wood engraving, linocut and collagraph are representative techniques of the relief print. The artist carves or cuts into a metal plate. These cut areas hold the ink, while uncut surfaces are wiped clean and therefore these sections do not appear in the print. There are two main methods of intaglio print. In the Direct Incision method, artists incise the plate directly using sharp tools. Engraving, Drypoint and Mezzotint are representative of this method. In the Acid Method, artists incise through to expose parts of the plate to be eaten away by acid. Etching and Aquatint are representative of this method. Copper (‘doban’ in Japanese) is often used for the plates. Polymer Intaglio is a new technology developed to use polymer coated plates in order to eliminate the use of acid. In this method, the plate for printmaking is flat with both image and non-image areas on the same surface. The process emphasises water-oil repellency. Ink adheres only to the greasy areas of the plate. Each colour usually requires a separate plate. Lithography is the most common technique within this method. A plate, often made of aluminium, zinc or limestone, is chemically treated and finely roughed so that the whole surface has sand-like indentations. An image is drawn directly onto the plate with an oily medium like a crayon or tusche. The plate is inked with a roller after being sponged with water. Paper is placed on a plate, and run through a press. 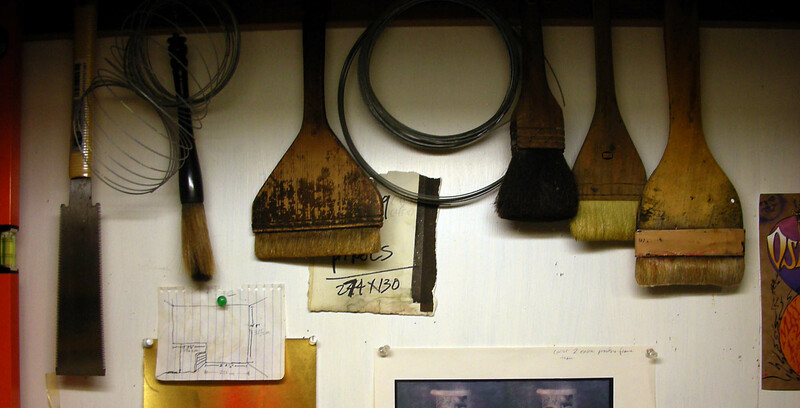 Lithography is an excellent method to produce detailed brushstrokes or crayon textures. Offset Lithography uses both lithograph and offset printing methods. The plate is usually made photo-chemically. The inked image on the plate is directly transferred onto paper by a cylinder-shaped rubber roller. Water is used to preserve the blank areas. The artist uses silk fabric, paper or nylon which is cut, perforated or blocked with screen filler to allow ink to selectively pass through the stencils. An image is printed when ink is forced through the untreated parts of the stencil onto a paper. Thus in this process the image does not have to be reversed as in most other print techniques. Each colour requires separate stencil and inking. Silkscreen or Serigraphy is the most common type of stencil print.